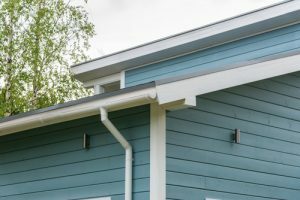 Gutters and downpipes are part of your storm water system, and their purpose is to direct water away from your roof and prevent your property from any water damage. 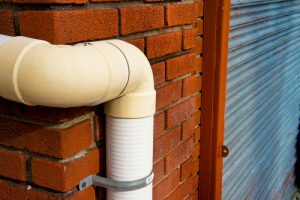 Rusted or clogged up gutters and downpipes can cause countless problems, and it’s in your best interest to invest in gutter cleaning at least twice a year – in fall and spring. While it’s recommended to call in professionals who have years of experience and can quickly and safely remove any debris and clean your gutters completely, you could also handle some simple maintenance steps yourself. If you notice some signs that your gutters need to be cleaned, read on to learn what you can do. While we suggest you clean the gutters at least twice a year, if your roof is directly beneath some trees or you live in an area with frequent rain (and if you’re in BC, you know that all too well! ), you might want to clean them more often. Take on this task only if you’re completely sure you can handle it. You’ll need to climb up a ladder or walk on the roof, and if you’re unsure you can safely work like that, or if your roof is higher than a single story – call the experts, it’s better to be safe than sorry. Protect yourself with a pair of gloves, some goggles, and a dust mask. The most common types of debris you’ll find in the gutters and downpipes are leaves and twigs, and the first thing you should do is scoop them up and throw them away. 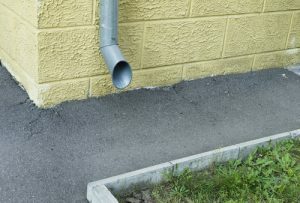 You can use a gutter scoop to help you and make sure to work away from the drain outlet so that nothing falls into the downpipe and clogs it. 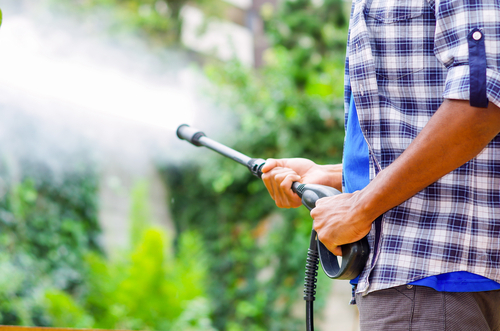 A high-pressure hose nozzle attached to the end of your water hose will help you wash out the gutters. This will also let you know if the downpipes have been clogged so you’ll know whether you need to clean them. Any encrusted dirt can be cleaned with a stiff scrub brush, and if you notice any rust you might be able to scrape it out, paint with a primer, then use rust preventing paint. However, you might be better off switching to new steel or aluminum gutters. If you notice water doesn’t drain through the drainpipes, you can try flushing debris out with a hose. A drain snake can be used to pull the debris out from the bottom or push it through from the top. To ensure you have a trouble-free home and that your gutters and downpipes are well maintained, invest in leaf guards and soffits. Soffits not only keep your home looking beautiful, but they can also help with keeping elements and animals out of your attic and allow for air to circulate in it. Leaf guards can make gutter and downpipe maintenance easier by preventing larger debris from falling into them. For your peace of mind, call in the Vancouver gutter experts to inspect and clean your gutters and downpipes. This can save you a lot of time and money since you’ll be aware of any minor issues that can become huge problems down the line. Contact Complete Gutters today to find out more and book your next appointment.